Also, yesterday I wrote a guest post for The Journey Creating Me. It serves as a great intro to my blog and style, so be sure to check it out! Happy Tuesday! Tyler and I arrived back in town from Chicago late last night. We had such a fun time exploring a new city together! A recap of our trip will be coming in the next few weeks. In the meantime, I wanted to introduce you all to Amanda from Meet at the Barre. Amanda was one of my first blogging friends; we have been commenting back and forth on each other's blogs for months now! My favorite post of hers are her "Humpday Confessions" each Wednesday.... they are so funny! I recommend this one... the gifs are on point! Hi everyone my name is Amanda and I write over at Meet @ the Barre. I wanted to thank Darcy for letting me guest post over at her home today! 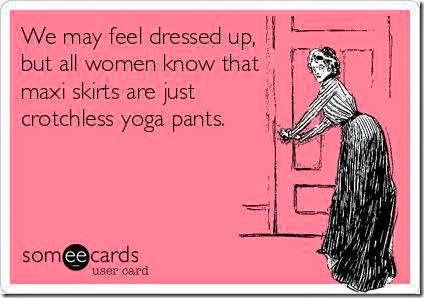 My little corner of the interwebz is a lifestyle blog with a focus on fitness, healthy living, daily dose of humor, and fashion. I love finding great deals! I was raised under the saying "Anybody can buy something full price". I recently tried my hand at some fashion posts and wanted to share them with you!! 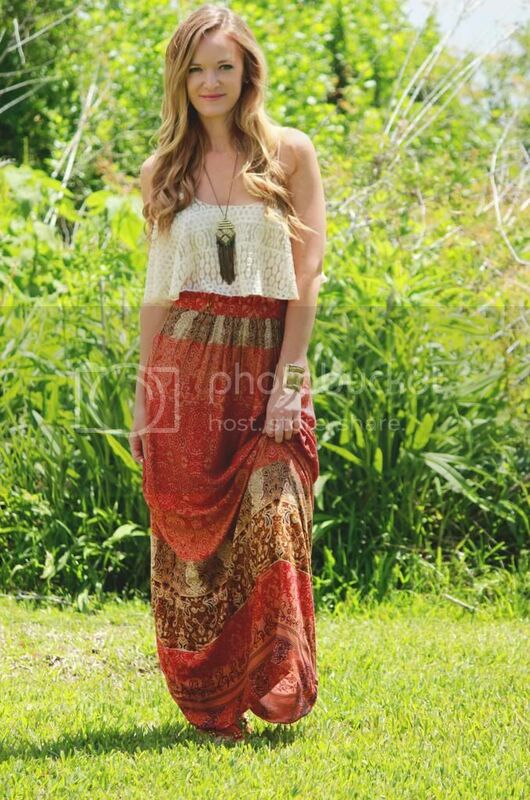 Maxi Dresses are definitely here to stay and definitely monopolizing the shelves for this upcoming season. This is one of my favorites right now. Red is definitely a statement color! I wanted to find a long gold necklace and channel my inner 70's goddess in this dress and I think the necklace really nailed it what do you think? So what do you think? Are you liking the maxi trend? I like how they can be dressed up with an Espadrille wedge or dressed down with a Gladiator sandal. Thank you Amanda for taking over the blog today! Hi everyone! If you follow me on Instagram then you know that I am currently in Chicago for a long weekend trip with Tyler! Since I won't be by a computer to blog, I wanted to take this time to introduce you all to some of my favorite bloggers! First up in Shannon from Upbeat Soles. I first found Shannon through Instagram. She has amazing pictures and outfits each day. (And each day I am more and more envious of the sunshine and weather she has!) I know you all will just love her! Hi all of Darcy's beautiful readers! This is Shannon of Upbeat Soles! I am super excited to be guest posting for Darcy while she is living it up in Chicago! Yes, I am very jealous too! Just a little bit about me, I am a 20 something (somewhat) newlywed, dog mommy, native Floridian, chocolate obsessed, fashion lover. Ya that pretty much sums me up. 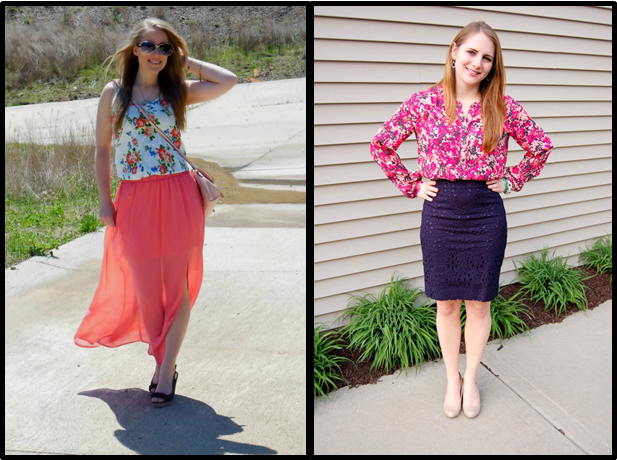 Over at my blog you'll find daily outfit inspirations that will never break the bank! I would describe my style as trendy with a boho vibe, you can check it out here and with my daily outfit below! Big thanks to Shannon for taking over my blog for the day! Follow along on Instagram to see my Chicago adventures :). Meet Shannon from Upbeat Soles! I am not one to shy away from leopard print. (Click here to see all my looks with something leopard in it.) When I am at the office, though, I like to keep my leopard print in small doses. It is usually found in my accessories. However, when I found these pants at Gap last year on crazy clearance ($6 to be exact) I knew I had to have them. They were a little out of my comfort zone... but isn't the point of a fashion blog to push us out of our fashion comfort zones?! ;) I never got the chance to wear them last year because I purchased them right before the start of cold weather. (Me + ankle pants + cold weather = not happening.) I was finally able to break them out and I love them! I think they will look very cute with a pink top, but this time kept it basic and just added in a pop of pink. Since the pants are very loud, I kept the rest of my accessories simple. I think it is professional yet fun. You know your office best, so you can determine if something like this would work for your job! Congrats Kelsey! Norka will be contacting you directly so look for an email from them in the next few days. I have been looking for a patterned clutch for weeks now. (Ask my mom -- I have dragged her into countless stores over the past two weekends looking for one!) I cannot find what I am looking for anywhere in store so I am turning to the Internet to find what I need. Honestly it was difficult to find what I was looking for online, too! Above are my current picks. 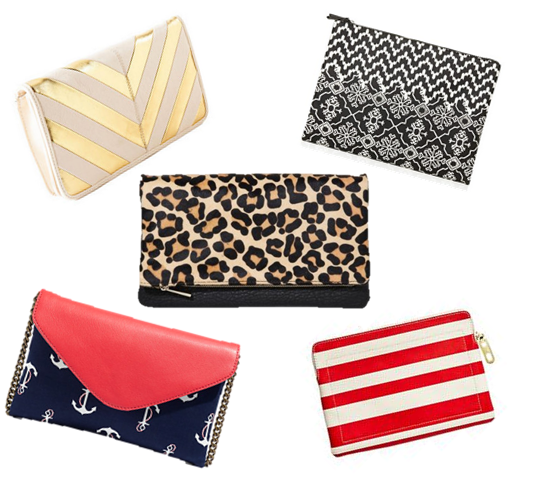 I think my favorite is the Gap printed leather clutch, although what I'm really looking for is a floral print one! If you have seen one, please let me know in the comments below :). Also, today is the last day to enter the giveaway for $50 to Norka! Enter using the rafflecopter below. The more entries you complete, the better chance you have of winning! Today I am collaborating with Hannah of Sweeter than Serenity to show you all how we are wearing floral print this Spring! Hannah and I have such similar styles; so often when I read her posts I think to myself, "Oh! I have that, I should recreate this look!" She is so sweet and shares such great looks and recipes over on her blog. 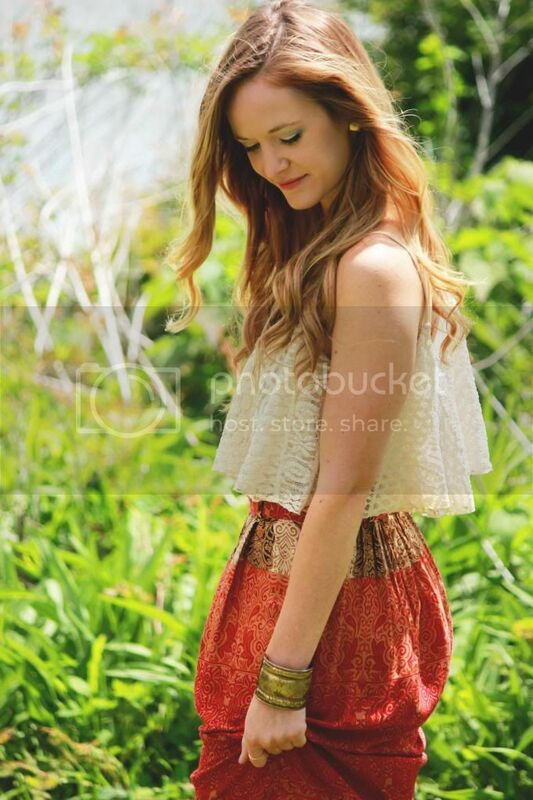 Head on over to Hannah's blog to see more from her look :). Recently, I started thinking of glasses as an accessory. When I needed my first pair Junior year of college, I just picked a simple pair. I only needed them if I was working on a computer for a long time, so I picked something very understated. Within the past year, however, I have found myself reaching for glasses as a completer piece to an outfit. For that reason, I wanted to get another pair to choose from. I have one pair that is a tortoise design, but wanted a fun color. I did not want to spend a lot on the frames, but I wanted a quality pair of glasses. When I found Ozeal Glasses, I was able to find exactly what I was looking for. Their selection of glasses is incredible. They have hundreds of frames that are different styles, colors, shapes, etc. The best thing about them, is that the prices for frames start at less than $19.99! The exact pair I choose is under $60 and that includes my prescription! I would never be able to get that kind of price in my eye doctors office. The prices are perfect; especially since these are just an additional pair of glasses for me! When you are online browsing through Ozeal's glasses, you are able to do a virtual try on. It helps you see how the glasses will look on you -- and is very accurate! Mine fit great and are comfortable on my face. It was extremely easy to order the glasses and add in my prescription, too. The hardest part was honestly just narrowing down what pair I wanted! I am now considering ordering a pair of sunglasses with my prescription in it. With prices like that...why wouldn't you!? If you like the ones I am wearing, shop here! I love them and think the color blocking detail is awesome! Also, don't forget to enter the giveaway for a $50 credit to Norka below! Ozeal sent me a pair of glasses for my review. All opinions are my own. If you have been reading my blog for awhile then you know that I love finding new shops on Instagram and Pinterest. Most recently I discovered Norka and I am obsessed! Their prices are amazing. I have been really wanting to add more short sleeved blouses and tank tops to my wardrobe and they have such a great selection. When I saw this top I knew I had to get it! I love how it looks with jeans, but think it will be so cute with shorts and wedges for nights out in the Summer. I love the color blocking and the leather detailing on the shoulder! I am so obsessed with Norka and had to share the love with you! Norka has graciously offered to give one reader of A Memory of Us a $50 gift certificate to their shop! 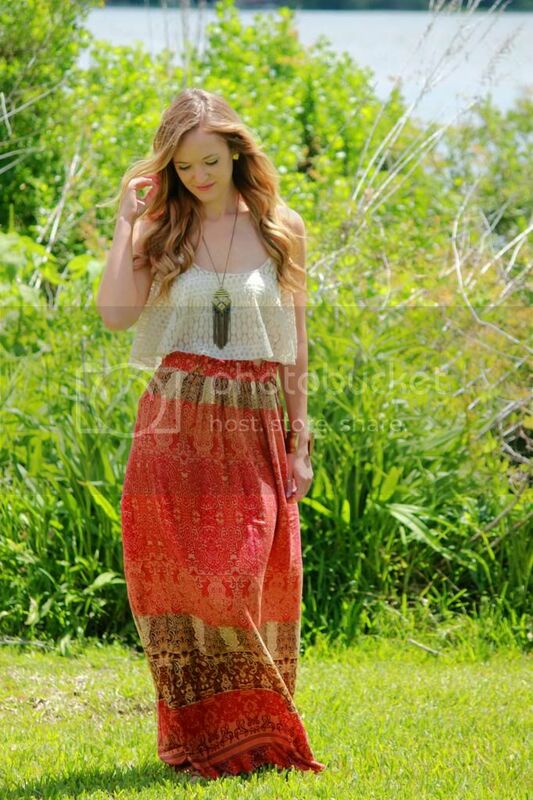 If I could win, I would use the gift card to buy one of their adorable maxi dresses! Enter using the rafflecopter before. Complete all the entries for the best chance to win :). Also I am being featured on On the Daily Express today as an "Expert Stylist". Be sure to head over to check out the post! There is a fun giveaway happening here tomorrow so be sure to check back! Have a good day :). We have officially less than one year until our wedding! Planning is starting to get more serious since we are getting closer to the date. Most recently, I asked my bridesmaids to be a part of the wedding. I knew I wanted to find a cute and creative way to ask my bridesmaids to be a part of our wedding. I chose to mail the requests because my bridesmaids are spread out over four cities. I knew I wouldn't have the patience to ask one bridesmaid one week and have to wait another week (or longer!) to ask somebody else. Since I would be mailing them, I knew I wanted them to be something special. I decided I would make a bridesmaid box to send to each of the members of my wedding party. I wanted to keep it simple and inexpensive, so I purchased craft boxes from Michaels. To incorporate our wedding colors of navy, mint, and gold I spray painted the boxes gold and added in navy crinkle paper shreds. Next, I found some mint scrapbook paper and set it aside for when I wrote out my notes. I kept looking for a unique way to ask my bridesmaids to be in my wedding. I knew I wanted to incorporate nail polish into the request, as a fun and inexpensive gift for my bridesmaids. I started googling wedding related nail polish names. Surprisingly it was hard to find a nail polish with a wedding themed name. Luckily, I finally found the nail polish color "Diva Bride" by China Glaze. I decided to use this polish name as a fun saying to include in the bridesmaid box I was sending. To incorporate the nail polish name into my note, I added a note saying "I promise I won't be a diva bride!" I also included the date of our wedding to remind everybody to keep the date clear on their calendar. My next step was finding a cute saying to ask with. I wanted to write something more than just "will you be my bridesmaid." I decided on the phrase "The best day ever includes you! Will you be my bridesmaid?" Our wedding will be the best day ever, and I want my best girls by my side. Above is the final product. I love how everything came together. I feel like it is the perfect way to ask a bridesmaid. It is simple, yet thoughtful. It is fun to receive, yet still inexpensive. 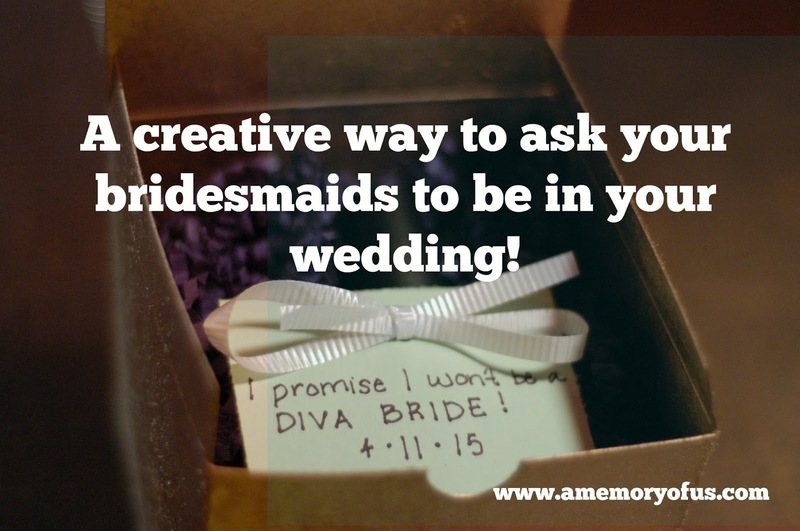 (I am amazed at how expensive some ways to ask a bridesmaid are!) It was so fun to get phone calls with everybody accepting. What was surprising was that my friend Erin, who lives in New York, was the first person to receive the gift. My friend Emily, who also lives in Kansas City, was the last! Funny how the mail works : ). My side of the wedding party is my sister, two best friends from high school, and two best friends from college. Tyler has not asked his groomsmen yet, so he still needs to do that.Next up on our list of wedding tasks? Booking a block of hotel rooms for our out of town guests, reserving a space for the rehearsal dinner, and finding a wedding dress! To read all about our wedding planning, click here! I would love it if you would follow me on BlogLovin'!